Budapest had always been on our short list of places to visit, but up to this point of our adventure had not bubbled to the top as the obvious next destination. In mid-April, a good friend from Portland was passing through Europe on business and wanted to meet up with us for a short vacation on his way back to the States. Budapest met all the requirements of being near our current location, with convenient transportation options for our friend, and plenty to do and see while we were there. Budapest is literally a city divided. Up until the late 19th century, it was two cities: hilly Buda in the west and the flat plains of Pest in the east, with the Danube River flowing north to south in between. 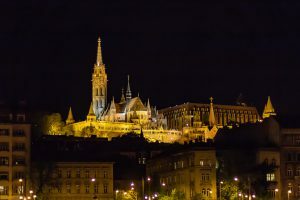 Though the merging of the two cities also merged the names together, it is still common to hear them referred to separately as the “Buda side” and “Pest side” by locals. One of the city’s nicknames is the “Pearl of the Danube” and checking out the sights on either side of the river makes it obvious why. Castle hill dominates the landscape on the Buda side of the river. Atop the hill you will find Buda Castle, Fisherman’s Bastion, and a maze of cobblestoned streets filled with restaurants, hotels, and shops. From the main courtyard of the castle, there is a breathtaking panoramic view of the Danube and Pest. 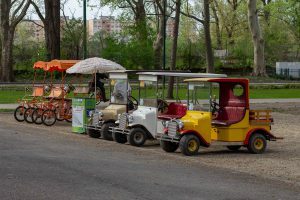 Reaching the top of the hill can be easily done on foot via several foot paths and staircases, a 150 year old funicular, or city bus. On one visit to the Castle District, we took a bus driven by an apparent Formula 1 fan as it was all we could do to hold on during his attempt to reach the bottom of the hill in record time. On the opposite side of the river, Pest’s relatively flat, grid-like streets offer a welcome change from the hills of Buda. Here the Hungarian Parliament Building is the main attraction and is as large as it is beautiful. There are many parks and public squares to spend leisure time in. Andrássy Avenue is a wide, tree-lined boulevard with mansions and high-end shopping, patterned after the Champs-Élysées in Paris. Following it away from the river will lead you to City Park. 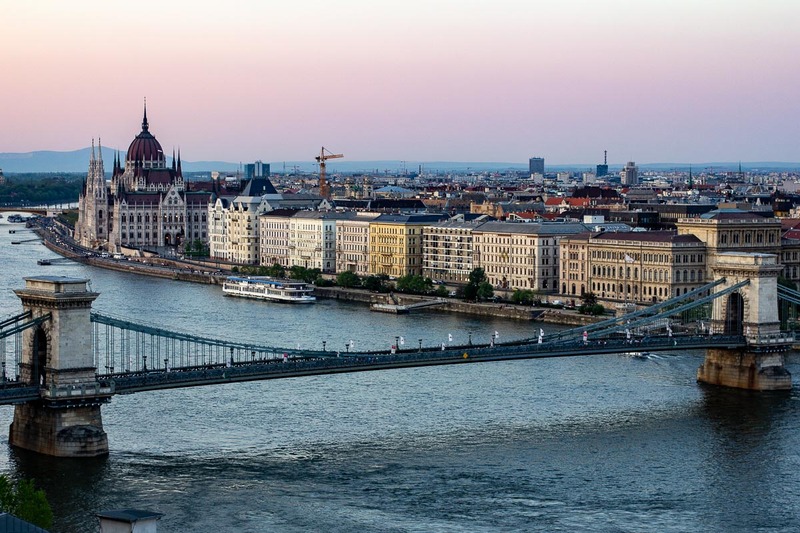 Home to a zoo, botanical garden, several museums and the Széchenyi thermal bath. Literally in the middle of the hustle and bustle of the capital city is an island of calm. Margaret Island can be reached on foot or bike via one of two bridges connecting Buda to Pest or by water taxi. Car traffic is limited to a parking lot on the north end of the island, intended for guests of the hotels located on the island. 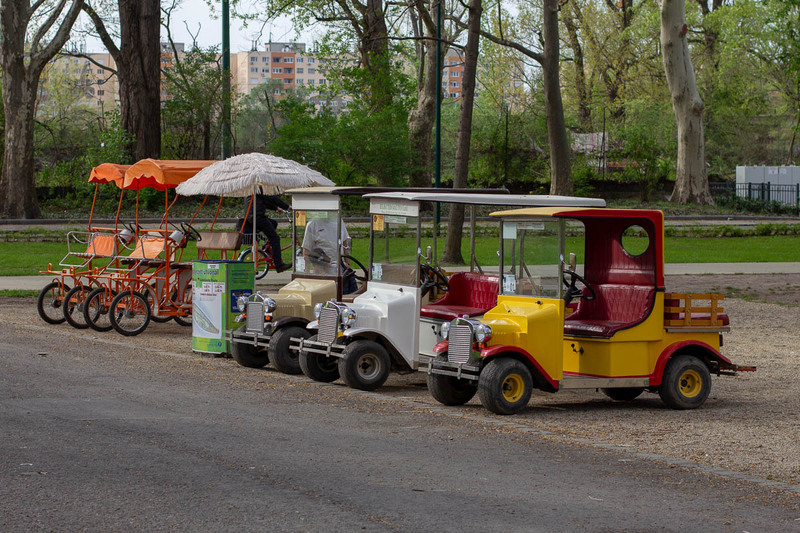 Once on the island, it is possible to rent pedal and electric powered cars if you’re already tired of walking through other parts of the city. On sunny days, locals flock to the island to enjoy the island’s greenspaces full of trees, meadows and gardens. Joggers enjoy a 3.3 mile (5.3 kilometer) rubberized running track circling the island. The most noticeable architectural attraction of the island is a 187 foot (57 meter) tall water tower built in art nouveau style. It also houses an exhibition space and open air theatre/concert venue in the summer months. A popular way of experiencing the many sites along the Danube River is to book one of the many sightseeing cruises available. We opted for a night-time cruise which included a prerecorded audio guide in multiple languages and a complimentary beverage (beer, wine, or something more kid friendly). 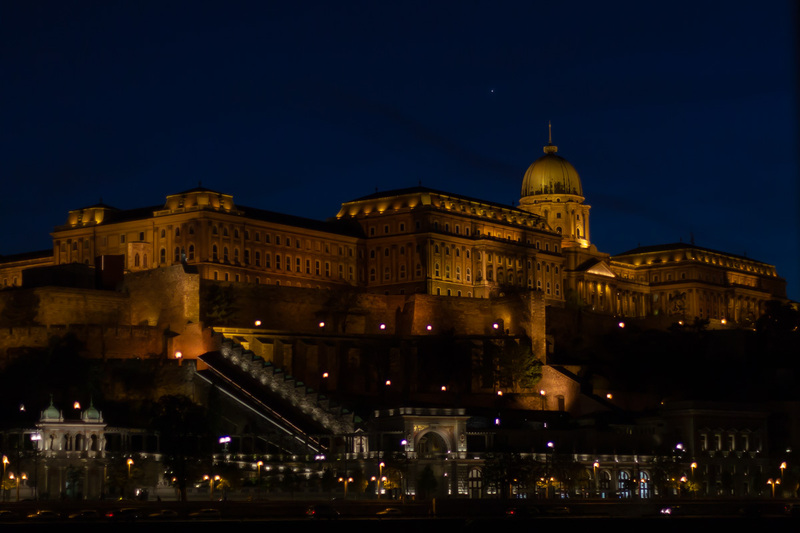 Budapest only gets more beautiful when lit up at night. 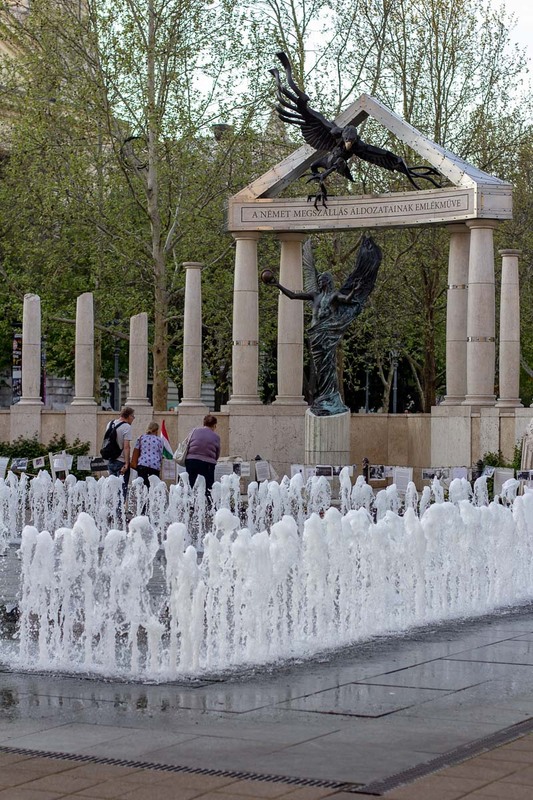 In Budapest you can find the typical statues and monuments honoring an important historical figure or event. As a tourist, these are often recognizable only as a topic read about in history class. One of my joys of walking around the city was running across something more meaningful to this 40-something American. Standing in the middle of a footpath in Freedom Square is a statue of Ronald Reagan honoring his work to end the Cold War. People passing by often stop to take a selfie with the former US President. At the other end of the square is the Memorial for the Victims of the German Occupation. 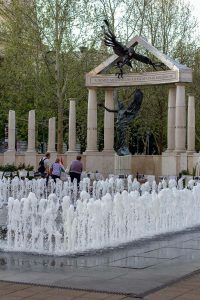 This monument was so controversial that the Hungarian government erected it under the veil of night and immediately prompted a makeshift public memorial to be created in front of it in protest. 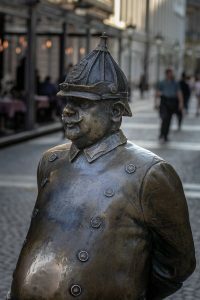 A statue of the fictional detective Columbo and his trusty basset hound can be found in a small square on the Pest side of the Margaret Bridge. While it seems like an unusual place to see such a statue, I later read that the actor Peter Faulk is of Hungarian descent even though he was born in New York City. In a busy shopping district near the Chain Bridge is the descriptively named Fat Policeman Statue modeled after the sculptor’s grandfather. The statue’s belly is shiny from being repeatedly rubbed to bring good luck. The more I’ve learned about the statues and memorials of Budapest, the more I realize that I only scratched the surface of the unexpected gems to be found all over the city. 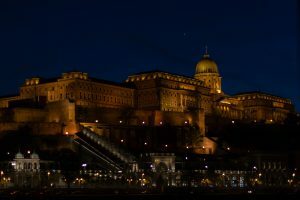 There is more to Budapest than interesting geography, beautiful architecture, and unique statues. 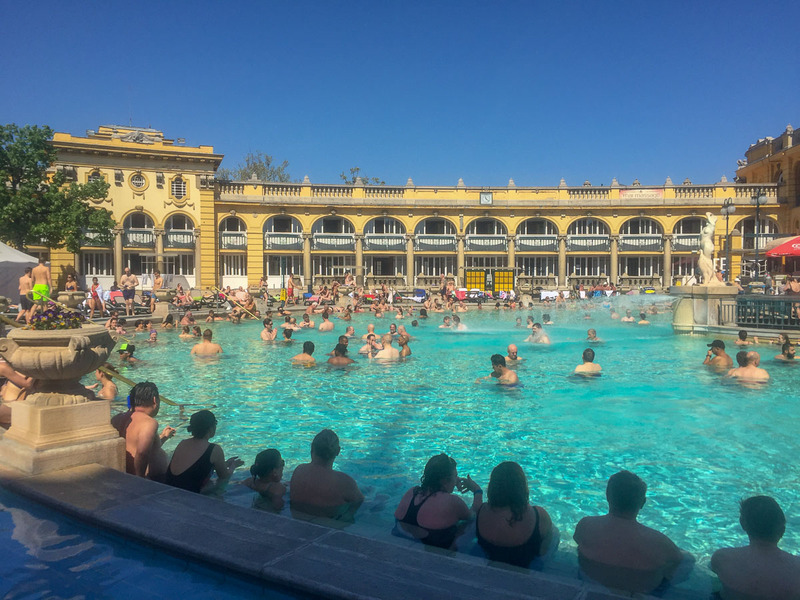 It is also known as the “Capital of Spas and Thermal Baths” and we spent a day exploring one. 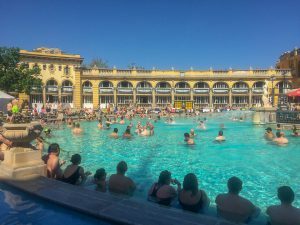 The Széchenyi thermal bath is one of the largest in Europe and popular with tourists and locals. It contains many pools of varying temperature both in and outdoors. Located in the same building, but not part of the Széchenyi bath is the Thermal Beer Spa. 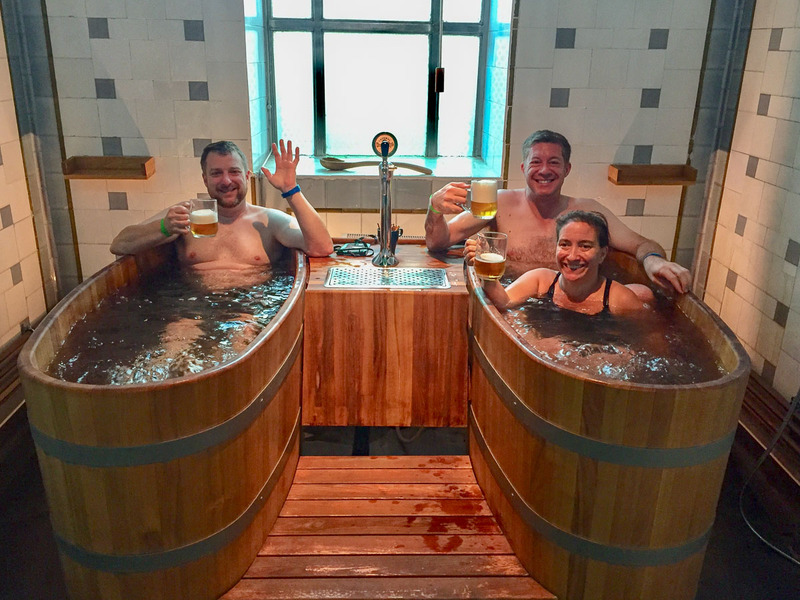 Guests soak in couple-sized wooden tubs filled with the same thermal mineral water from Széchenyi, but beer making ingredients (malt, hops, and yeast) are added to make the experience extra special. At first impression it seemed unappealing to sit in a tub of beer, but in reality it is in such low concentration that it’s not much different than a normal bath. 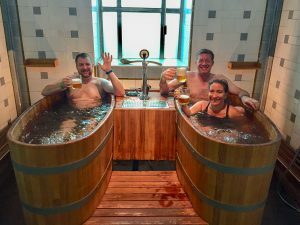 To make the experience even more appealing, there is a beer tap right next to the tub with an unlimited supply of a local beer. Found in the basement of a somewhat unassuming apartment building is the Budapest Flipper Museum. This off-the-beaten-track tourist destination is the perfect combination of museum and arcade. For the low price of 3000 HUF (roughly $10), guests get unlimited play on over 130 different pinball machines. The “exhibits” span the history of the first pinball machines from the 1930s and 40s to modern times. We spent a couple of nostalgic hours reliving time misspent in the arcades of our youth. Upon our arrival, we found that Budapest was hosting the Ice Hockey World Championships. Well, that’s how I read it. Our temporary travel companion and real hockey fan explained that the tournament was actually for the second tier Division I, Group A teams and the Top Division teams were playing in a tournament elsewhere. Undeterred, we acquired tickets for the Great Britain vs Slovenia match. 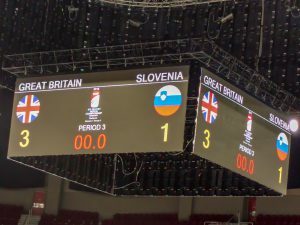 I have to admit, my first reaction was “Great Britain plays hockey?? ?” and I was not expecting a good game. We found out that not only do the Brits play, but they play pretty well. They defeated Slovenia 3-1 and went on to win the tournament, getting promoted to the Top Division for next year’s tournament.